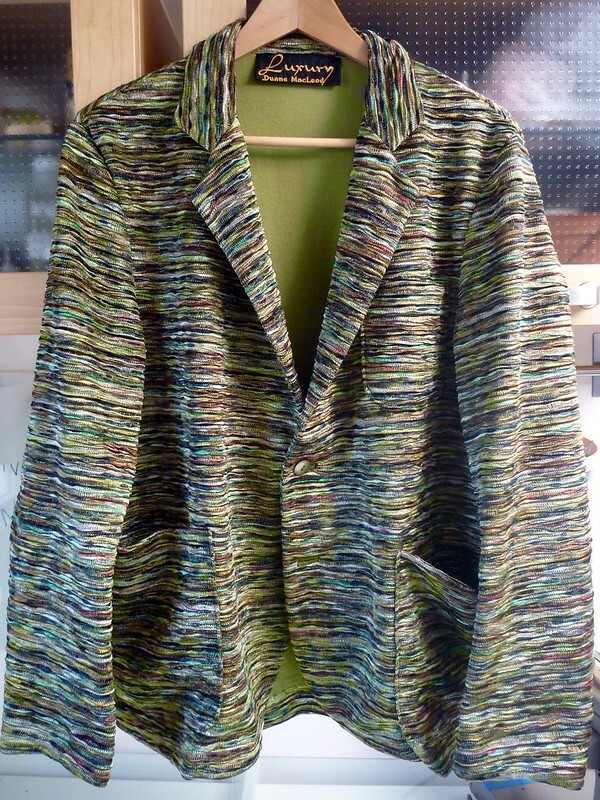 The Japanese Pattern Challenge: Missoni Sweater / Blazer #2 -- It's a Wrap! Yay! I finished before the deadline. This post is primarily for other PR contest members who may be interested in some of the construction details. The contest rules don't allow for many photos. I think I can submit only 3 photos, one of which has to be the "inspiration" garment. 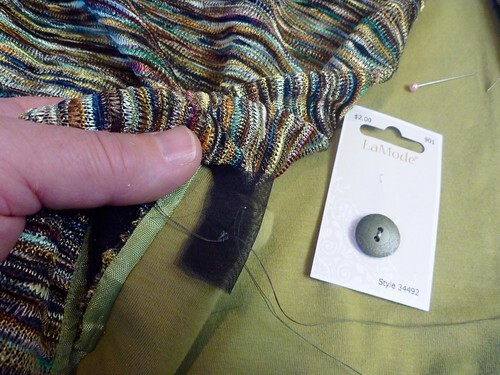 Because the fabric is loosely knit, I reinforced the back of the button with a small scrap of silk organza. This will prevent the button from being pulled out. 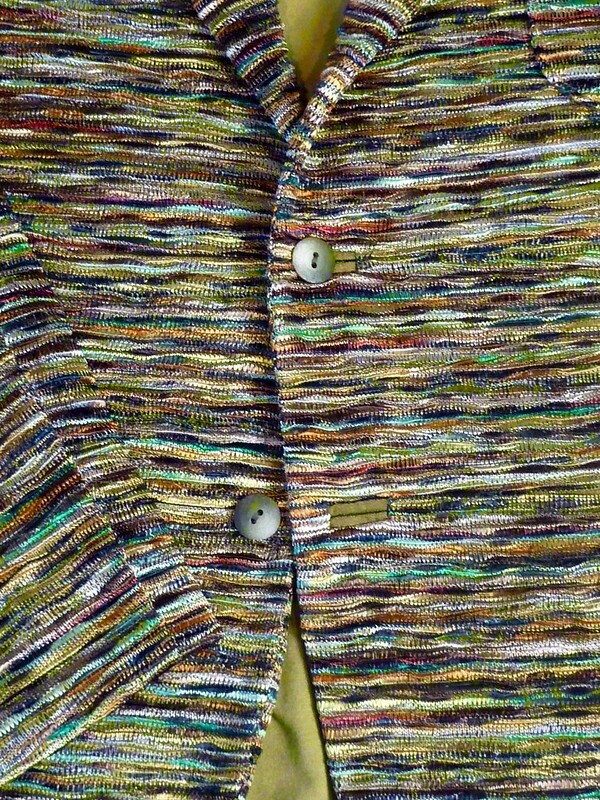 This picture also gives you a good idea of how many colors are worked into the fabric. It's really quite amazing, and to my mind, beautiful. 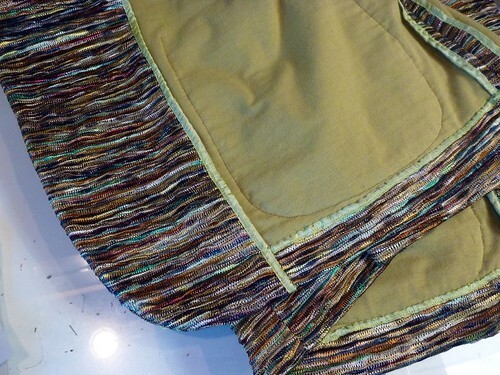 All of the seam allowances, facings and hems are finished off with Snug Hug rayon seam binding. Time consuming and at times kind of fussy, but I love how it looks. It's nice to know that if I need to take my jacket off, people will see that it's just as pretty inside as it is outside. Here are the bound buttonholes, a la Laura Mae over at Lilacs and Lace. I made them with scraps of lining, beefed up with some lightweight fusible interfacing. Her tutorial makes this SO easy. If you've avoided bound bottonholes, by all means follow her well illustrated directions. You'll never fear them again! So here's my finished jacket. Time to get out the tripod, take of some pictures and post my entry to the contest. Wish me luck ..... Or better yet, throw a vote my way! Oh..... And have you seen the Missoni offerings for Fall Winter 2015? How freakin' gorgeous are these!!! Beautiful job, Duane! And I'm very impressed with those labels. Where did you purchase them? Peter, they were a gift from my daughter. They had a very fancy embroidery machine where she used to work. I just love them, and since my supply is very limited I only use them on really special makes. Cool. Your first one was popular on SSB. Look forward to seeing No 2. Great, great job! And yes, these are freaking gorgeous! Love it! I can't wait to see this on. Amazing jacket and I've just spent far too much time checking out your blog! Amazing tailoring and attention to details, thank you.